The pneumatic sled inside of the Voxel8 Developer's Kit is one of the most unique hardware components on the printer. Due to its custom design, this article attempts to document some of the issues you may experience when operating the machine in regards to silver printing usage. 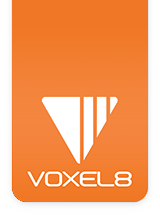 NOTE: All gcodes for the Voxel8 Developer's Kit Printer are located on the support site. The most common gcodes are listed here. In order to troubleshoot some specific issues with the pneumatic tank and air pressure, it's required to login to the Voxel8 Control Interface, first. By default, print operators cannot issue gcodes without first logging in. Note the machine's IP as assigned (see Picture 001-A) in Settings->Printer Info. Write it down. Attain the machine's password by using the front touch panel under Settings->Printer Info. Write down the password displayed (see Picture 001-B). Picture 001 A,B: Voxel8 Control Interface with assigned IP and password. Using a modern web browser, access the direct IP assigned to the Voxel8 Developer's Kit Printer (see Picture 001A). Using the Login button in the upper right hand and login using the assigned username: "admin" and password (see Picture 002-A). Picture 002-A: Login button in the Voxel8 Control Interface. Once logged in as admin (see Picture 003), you can start to run some troubleshooting in regards to pneumatic, as well as other areas in Octoprint. Picture 003: Printer operator is logged into the Voxel8 Control Interface. The Voxel8 Developer's Kit printer supports both house air as well as an internally located tank (underneath the machine). See Picture 004. Picture 004: Pneumatic Sled with pneumatic hose connected to internal tank. It is possible for the tank to develop a leak over time with sufficient print hours and usage. When this occurs tank pressure will be near zero and won't be able to attain 40 psi which is the default. 40 psi is the maximum tank pressure allowed for the Voxel8 Developer's Kit Printer. Checking the tank for pressure is done by issuing the gcode command below (see Picture 005-A). When executed, if the tank pressure is below 40 psi, the the machine should start to buzz while the tank attains the correct pressure. When it is done, the tank will go quiet. Picture 005: Sending the gcode to set the tank pressure to 40 psi. When issuing the M125 S40 command, the M105 status commands will display the pressure (see Picture 006). Picture 006: The "P" value indicates the tank pressure. Here it is filled to the max. 40.8 psi/40.0 psi. An alternative method of checking the tank pressure is to set the pressure within the Octoprint UI (see Picture 007-A). Picture 007-A: The graphical way of setting tank pressure. If you find that tank pressure cannot be attained and all pneumatic hoses are correctly attached, then it is most likely a faulty tank. you should contact Voxel8 for a replacement. A incorrectly connected hose at any point in the pneumatics system can cause a loss in pressure. At major loss in pressure will result in the regulator "clicking", as indicated in the Developer's Kit Printer Sound Troubleshooting page. When this happens, check the following hoses (see Picture 008A, 008B, 008C, and 009D - a stopper plug, not a hose). Make sure they are all well seated into their chambers by depressing the surrounding o-ring, and pushing down on the hoses to insert them. On the back of the machine is the pneumatic sled, and the hose that feeds into silver print head at the top of the Developer's Kit Printer. You should check the hose depicted in Picture 009 as well. NOTE: To remove a hose, depress the o-ring, and pull up on the pneumatic hose. Picture 008A, B, C, D: The pneumatic hose on the back of the Voxel8 Developer's Kit printer. Picture 009: The pneumatic hoses on the core XY carriage. During the operation of the Voxel8 Developer's Kit printer, users will remove and insert the silver print head more frequently than the FFF thermoplastic print head. Due to this wear and tear, the print head can suffer from an issue relating to wiring on the printer, which causes the printer to stop dispensing silver ink despite not having a clogged nozzle, nor sufficient tank pressure. Picture 010: The bottom power connector of the silver print head has become disconnected. Picture 011: The top of the silver print head is disconnected from power. Air pressure with the Voxel8 Developer's Kit printer is variable depending on external ambient temperature around the printer. Sometimes the machine can over extrude and sometimes under extrude due to the lack of flow calibration by machine hardware with the first generation. Typically when running alignment, the machine will always print enough silver to detect trace with the laser profilometer. Users should dial in the silver printing by following the instructions in the Silver Printing Calibration article. The pressure sweep (see Picture 012 & 013) can be downloaded from here: 7 Sweep Pressure test print. Picture 012: The silver sweep test print. Picture 013: The silver sweep test displaying under, over, and optimal extrusion of silver. Red tip nozzles that are clogged with silver or other debris, as well as bent or damaged nozzles are some of the biggest culprits to silver extrusion problems related to insufficient air pressure getting to the tip end. One of the most common issues with the Developer's Kit printer is that silver can cure into red tip nozzle end over a few hours time when the machine is idle and not actively printing silver (see Picture 014A). This can cause "failed to detect trace" errors during alignment as well as print failures (e.g. under extrusion). Picture 014A: The red nozzle tip has silver cured to the end of the tip causing print failures. If solvent is not applied to the wiping sponges within the capping mechanism, silver can build up on the red nozzle tip and cause print failures as well (see Picture 014B). Picture 014B: The red nozzle tip has clogged with cured silver. A final error condition can occur when a red tip nozzle becomes bent or damaged during a build plate crash or other anomaly on the Developer's Kit printer (see Picture 014C). Picture 014C: The red nozzle tip has bent and is no longer viable for printing. It is very easy to inspect the nozzle for clogs or damage, and involves just holding it up to a strong light and seeing if a bullseye of light can clearly be seen through the red tip nozzle (see Picture 014D). If not, then the nozzle should be replaced immediately (see Picture 14E). Picture 014D: The red nozzle tip is still viable and has no silver cured in the end diameter. Picture 014E: The red nozzle tip has clogged with cured silver. Exchange the nozzle with a new one from the provided Voxel8 Developer's Kit supply, or order new red tip nozzles from the Voxel8 store. If the Voxel8 Developer's Kit Printer ever starts clicking consistently and checking hoses for an unseated connections fails, then it could be a sign of a lower level pneumatic system problem (e.g. internal leak within the sled itself). NOTE: When either popping the pneumatic sled to troubleshoot, or inspect it, you should take a picture of the electronics connections on the back of the machine before removing it. Picture 016: The back of the Pneumatic Sled pulled from a Developer's Kit Printer. Once the tank has been removed from the machine, you can visually inspect it for any unseated pneumatic tube fittings, or other problems. Picture 017: The Pneumatic Sled pulled from the Developer's Kit Printer. If nothing is visually wrong, then it is suggested to contact support for further assistance.